Holiday plants and flowers make great gifts for everyone on your shopping lists. They are perfect gifts for family members, the host and hostess of the holiday parties you attend, and of course, are beautiful for decorating your own home. Plus, they can be enjoyed long after the holiday season is over, adding color and life to your home on chilly winter days. But getting your plants to last longer will require a little special care. Here’s how to take care of the most popular gift plants, both during the holiday season and long after. 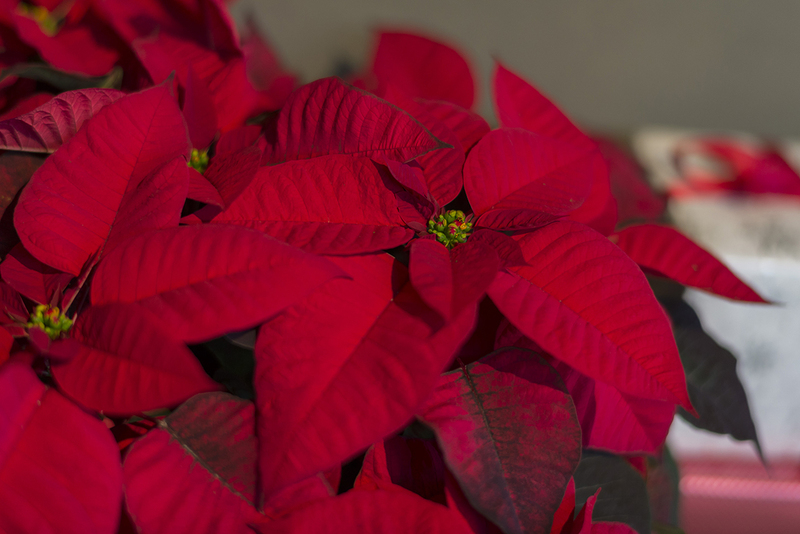 Poinsettias (Euphorbia pulcherrima) appreciate bright light away from heating vents, fireplaces, and drafty windows or doors. Maintain even moisture (but avoid soggy soil); plants will wilt dramatically if allowed to dry out. The plants should never be allowed to stand in water for more than 20 minutes if possible. As long as the plant looks healthy, continue to provide it with even moisture and warm temperatures in a bright location, out of direct sun. In six to eight weeks, it will begin to lose its leaves and turn slightly off-color. At that point, cut the entire plant back to 6 inches and repot in a larger pot, adding enough extra soilless mix or potting soil to fill the pot. Water thoroughly and place the plant in a south-facing window. Begin to fertilize the plant twice a month with a dilute 20-20-20 or 10-10-10 mix. New growth should begin. Begin pinching new stems back once a month to encourage bushy growth. Continue this pinching until the end of summer. In mid-May, after all danger of frost has passed, gradually introduce the plant to the outdoors, bringing it back in at night until the nighttime temperature remains above 60 degrees Fahrenheit. Then place the pot in a sunny spot where it is protected from strong afternoon summer sun. Water and fertilize regularly. When night temperatures approach 60 degrees, it’s time to bring the poinsettia back inside to a sunny windowsill. By the end of September, the plant must be placed in a completely dark closet or covered with a box every night from 5 p.m. to 7 a.m.—with no exceptions. After 7 a.m., it can be placed back in a sunny window but returned to the closet at 5 p.m. This dark treatment is necessary for the plant to set its flower buds. Provide normal water during the day and fertilize monthly. Poinsettia plants thrive in warm rooms with bright light and will suffer if exposed to drafts, sudden temperature changes, or excess dryness from heating vents. Continue this treatment until the middle of December, when the plant should be fully colored up for display again for the holidays. Amaryllis (Hippeastrum) bulbs should be potted up in wide, squat containers using a soilless mix. Allow the “shoulders” of the bulb to remain above soil level; water well once and then allow soil to dry out before watering again. Keep the pot away from direct sunlight, drafts, and heating vents. 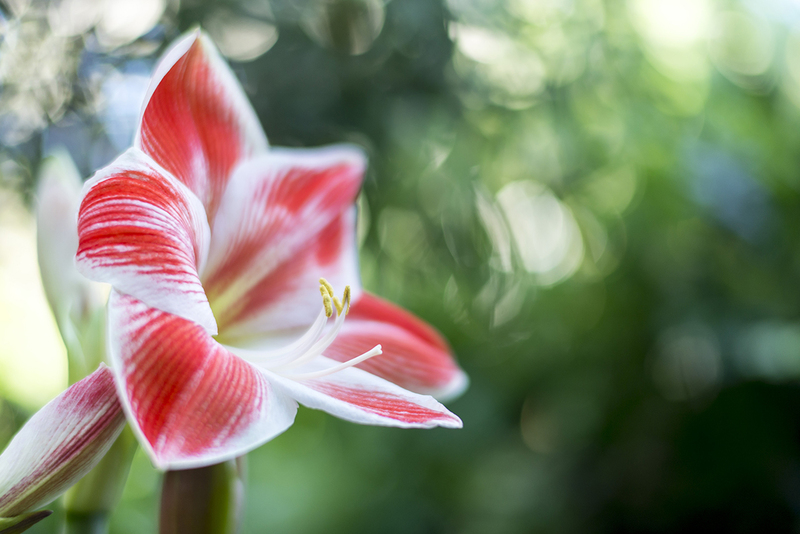 Most amaryllis plants will send up stalks and flower first (leaves will emerge after a bloom cycle). As the stalk grows, rotate the pot for even growth. After flowering, allow the stalks to yellow and wither before removing them from the bulb. Continue to water the plant after leaves emerge. After May 15, take the plant outside and place it in a location where it receives morning sunlight. Fertilize regularly with a dilute 10-10-10 or 15-15-15 mix. Around October 15, bring the plant inside for its resting period. If the leaves have yellowed, remove them from the bulb. If they are still green, allow them to yellow before removing them from the bulb. Take the bulb out of its container; shake off the dirt and place it in a cool, dark room (40 to 50 degrees). At that time, cut off any dried roots from the bulb and re-pot. Signs of new green growth can occur from six to 10 weeks later. Cyclamen plants prefer quite cool indoor conditions. Water only when the soil dries out, and avoid splashing water on foliage. 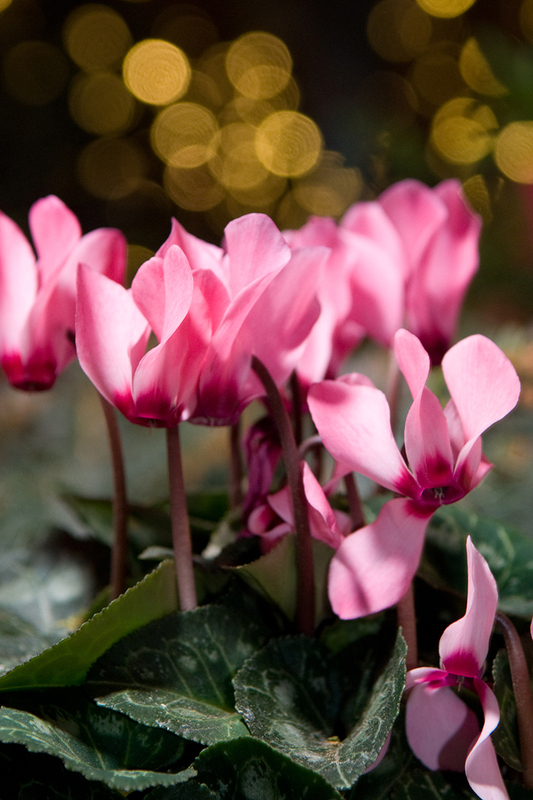 Cyclamen will continue to bloom for a few weeks if they are kept in a north- or east-facing window. Remove the faded flowers and their stems at the base of the plant as soon as possible to keep the plants blooming in a tidy fashion. Most gardeners find it too difficult to force the plant to bloom again the following season. 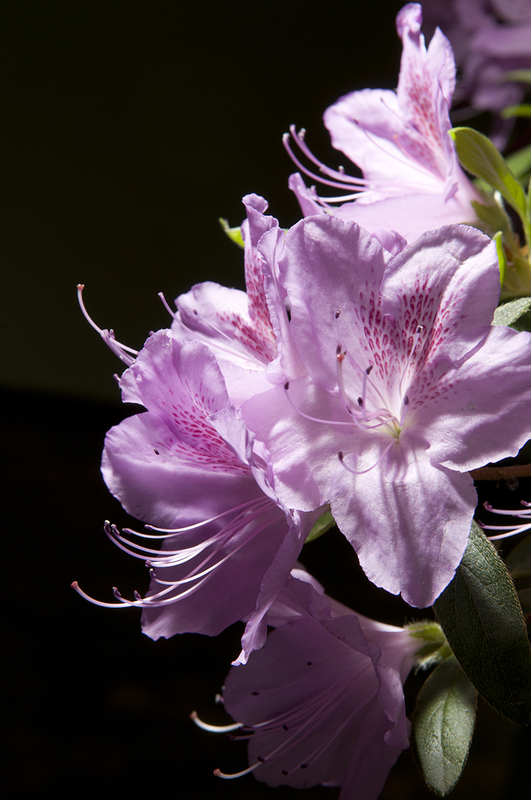 Azaleas require moist soil, bright light, and occasional misting. They perform best if kept in cool locations. Flowers will remain for months if old blossoms are quickly removed, the plant receives adequate moisture, and it is kept in cool conditions. In May, once all danger of frost has passed, the plant can be taken outside to a shaded or partially shaded spot where it only receives morning light in the garden. At that time, begin to fertilize twice a month with a dilute liquid fertilizer formulated especially for acid-loving plants. Bring the plant back indoors before October 15. Phalaenopsis or moth orchids prefer warm rooms in bright, but not direct sun. 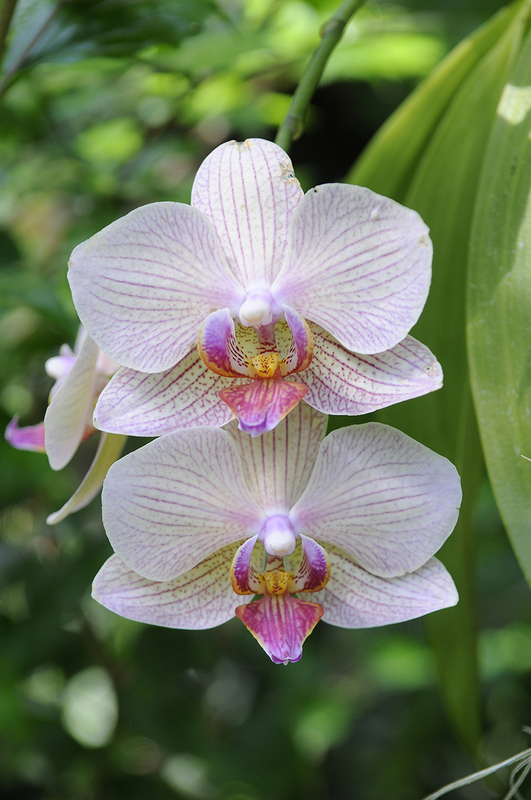 Moth orchids will bloom for months, but sudden temperature changes can cause the plant to drop buds. Remove drying buds to maintain the beauty of the plant. Orchids potted in fir bark generally require once-a-week watering. Those in potting soil can be watered less often. After flowering, allow the stem to yellow before cutting it off at the base of the plant. Begin fertilizing plant twice a month with a dilute orchid fertilizer. This will encourage the growth of a new stem and more flowers the following year. Wash the foliage monthly. It’s not necessary to take this plant outdoors for the summer; but it will tolerate being moved outside if kept in shady location, and not allowed to dry out. Continue normal watering and fertilizing until a new stem appears, approximately 10 to 12 months later. When the plant initiates flower buds, discontinue fertilizing. Continue to provide bright light—but keep out of direct sunlight—in a warm room. During winter, try to provide extra humidity from pebble trays, or by misting daily if possible. 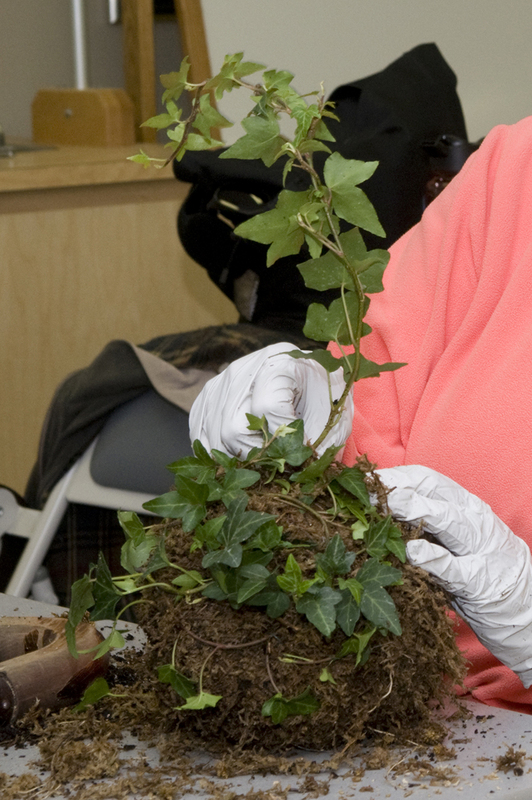 Ivy topiaries are popular holiday plants that can last for years if given proper care. Like cyclamen and azaleas, ivy also prefers quite cool conditions and bright light far away from heating vents or fireplaces. Mist the plant regularly, or rinse the plants in a sink to keep the foliage clean and free of spider mites. As new growth emerges, train the new growth to the desired form. Take the plants outside after May 15. Maintain growth during the summer by keeping the plants watered often, and fertilize them at least once a month, keeping the plants in a semi-shaded location. Continue training and pruning the plants periodically to keep their desired form. Paperwhites (Narcissus papyraceus) may require a cage or a ring of raffia tied around them to keep them from flopping as they grow. If purchased as bulbs, grow them in a shallow dish filled with pebbles rather than soil. Arrange the bulbs close together and cover them with pebbles, with just their tips exposed. (The weight of the pebbles helps to keep them from falling to the side as they grow.) Water just enough to encourage root growth, not soaking the bulbs. 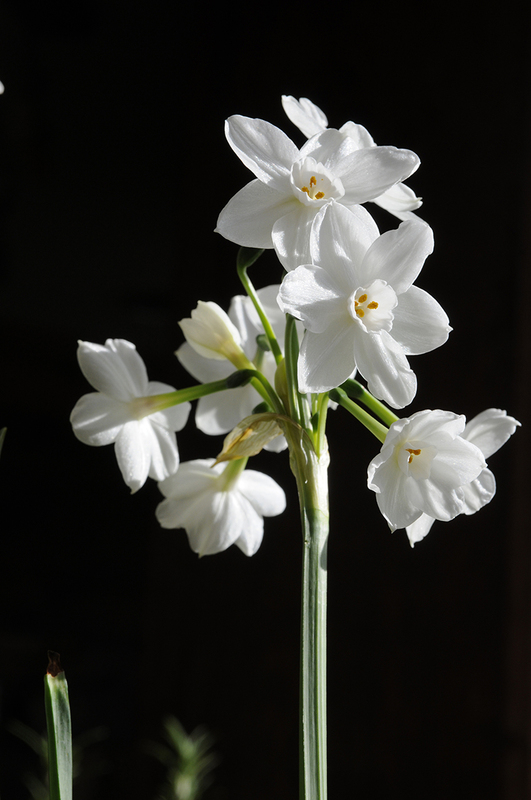 Paperwhites can be discarded after blooming, as they are not hardy to be planted outside in your garden.